Here's where some of that money has gone. 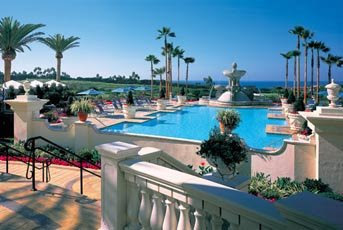 They held a retreat at the St Regis Resort in Monarch Bay. $1,400 at the Hotel Salon. This is insanity. Regular people losing their homes, big business taking "bailout money" and wasting it in our faces. Look, I know, these kinds of retreats are common. But you couldn't downgrade to a non 5 start hotel? Seriously, the St. Regis is one of the most luxiourous hotels in the area and when you are talking about California and LA that is saying something. 100 people went to this retreat. That is 2000.00 per person for the hotel rooms alone. You couldn't choose a cheaper hotel? Cut back a little? Forgo the massages and manicures in the face of the fact that your regular employees world wide are wondering if they will have a job tomorrow? Sick.